Draft: 2009, Toronto Blue Jays, 5th rd. Ryan and his wife, Felicia, were high school sweethearts, went to Louisiana State together and were married in 2013…the couple has two children, Kenley and Reed... His love for the university started "in the womb," as his mother attended Tigers games while pregnant…he grew up dreaming of playing football for the Tigers, but eventually specialized in baseball due to his size…his uncle ran track for LSU... Ryan finished his degree in general studies over the offseason…previous attempts to do so were interrupted by winter ball and instructional league action... Ryan is an avid outdoorsman who loves to hunt and fish. Opened the season as the Padres third baseman, his first career Opening Day roster…through the end of May, led the club and tied for 5th in the NL with 14 HR…optioned to Triple-A El Paso on June 9 and remained there for the rest of the season... Min. 150 AB, his .158 avg. (26-for-165) was the lowest in the majors and lowest by a Padre since Nick Hundley (.157) in 2012…61.5 pct. of his hits went for extra bases (2-2B, 14-HR)... Appeared in 53 games with 47 starts (46-3B, 1-DH)…at the time of his option, his 7 errors were most among NL third basemen... On Opening Day at LAD, homered off Clayton Kershaw in the 7th inning…became the first Padres third baseman to homer on Opening Day since Phil Nevin in 2000... On April 7 vs. SF, drew a career-high 4 BB... On April 26 at ARI, hit a 9th-inning, go-ahead, 3-run homer off Diamondbacks closer Fernando Rodney…it was the seventh time since data is available (1974) a Padre homered to turn a multirun deficit into a lead in the 9th inning or later… he was the first Padre to do this since Justin Upton on June 30, 2015 at NYM... From April 26-28, homered in 3 consecutive games for the first time in his career... Hit .202 (49-for-242) with 19 HR and 44 RBI in 69 games for the Chihuahuas. Split the season between Triple-A El Paso and San Diego, making his Major League debut for the Padres at the age of 28 and hit .217 (60-for-276) with 17 doubles, five triples, 20 home runs, 51 RBI and 48 runs scored to go along with an .869 OPS (.336 OBP, .533 SLG) in 89 games played...After signing with the Padres as a minor league free agent prior to the season, he began the year with Triple-A El Paso where he hit .355 (59-for-166) with 17 doubles, 15 home runs and 48 RBI in 51 games before having his contract selected on 6/14 for his first career call-up...Over his first 13 Major League games from 6/14-29 he hit just .103 (3-for-29) before hitting .231 (57-for-247) with 20 home runs and 50 RBI from 7/1 through the end of the season...Of his 60 hits on the season, 42 were for extra-bases with 17 doubles, five triples and 20 home runs, a ratio of 69.5 perecnt of his hits going for extra-bases…that percentage was the highest among all Major League players with at least 25 hits in 2016...Earned National League Rookie of the Month honors in July...just the fourth Padres rookie to win the monthly award and first since Josh Barfield in July 2006...also, Khalil Greene in April 2004 and August 2004 and Xavier Nady in May 2003...His 20 homers were the third-most all-time by a Padres rookie in a single season, behind Nate Colbert (24 in 1969) and Jedd Gyorko (23 in 2013)...His 20 homers also were the second-most ever by a Padres second basemen in a single season, behind only Gyorko's 23 in 2013...He finished tied for fourth among all Major League rookies with 20 home runs...Had three multi-homer games with two on 7/6 at Arizona, two on 8/12 at New York-NL and two on 8/19 vs. Arizona...Collected a career-high six RBI on 8/12 at New York-NL, at the time the most by a Padre in 2016 before Renfroe's seven RBI game in September…his six RBI that day was also, at the time, the most ever by a Padres rookie in a single game before Renfroe's seven...After receiving his first career call-up on 6/14, his 20 home runs from 6/14 through the end of the season were tied for the most in the Majors by a rookie, with Gary Sanchez also hitting 20 for the Yankees over that time…his 42 extra-base hits over that time ranked second-most by a Major League rookie behind only Corey Seager's 43 XBH over that span...His .869 OPS on the year ranked third-best among qualifying rookies from 6/14 through the end of the regular season, behind Trea Turner (.922) and Corey Seager (.886)...His .315 isolated power on the year was the second-highest ever by a Padre with 300-or-more plate appearances behind only Greg Vaughn's .325 ISO in 1998…was the fourth-highest ever by a Major League rookie with 300-or-more plate appearances, behind Rudy York's .344 ISO. Hit a combined .227 (90-for-397) with 24 doubles, two triples, 24 home runs, 58 RBI and 64 runs scored in 117 total games between Double-A New Hampshire and Triple-A Buffalo...Named an Organization All-Star for Toronto by MiLB.com following the season....After the season played in 26 games for Venados de Mazatlan in the Mexican Winter League, hitting .242 (24-for-99) with three home runs and 12 RBI. Spent the entire season with Double-A New Hampshire, hitting .210 (93-for-442) with 21 doubles, three triples, 23 home runs, 65 RBI and 67 runs scored in 126 games played...Named an Organization All-Star for Toronto by MiLB.com after the year. Split time between Dunedin of the Florida State League (A) and New Hampshire (AA) of the Eastern League...Began the season with Dunedin, appearing in 96 games while posting an OPS of .832...Named a Florida State League mid-season all-star...Named MiLB.com organizational all-star...Promoted to New Hampshire on July 31...In 33 contests with the Fisher Cats, posted an OPS of .980, including eight doubles and eight home runs...Hit .309 with eight home runs and 15 RBI in August. Was placed on the disabled list from April 7-June 9 with patella tendinitis of the right knee...Spent the entire season with the Dunedin Blue Jays (A)...In 57 games posted an OPS of .792 while recording 21-XBH (10-HR). Split time between Lansing of the Midwest League (A) and Dunedin of the Florida State League (A)...Began the season at Lansing where he was named a mid-season all-star...Recorded 23-2B, 10-3B and 6-HR in 92 games with the Lugnuts...Promoted to Dunedin Blue Jays on Aug. 12. In his first professional season, appeared in 36 games, all but two was with the Auburn Doubledays...Hit .287 with 11-XBH in those 34 contests with Auburn. October 23, 2018 Naranjeros de Hermosillo placed IF Ryan Schimpf on the reserve list. October 19, 2018 IF Ryan Schimpf assigned to Naranjeros de Hermosillo. 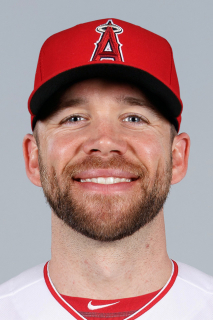 May 22, 2018 Los Angeles Angels released 3B Ryan Schimpf. May 3, 2018 Los Angeles Angels optioned 2B Ryan Schimpf to Salt Lake Bees. May 2, 2018 Los Angeles Angels recalled Ryan Schimpf from Salt Lake Bees. April 12, 2018 Los Angeles Angels optioned 3B Ryan Schimpf to Salt Lake Bees. April 7, 2018 Los Angeles Angels recalled Ryan Schimpf from Salt Lake Bees. April 1, 2018 Los Angeles Angels optioned 3B Ryan Schimpf to Salt Lake Bees. March 31, 2018 Los Angeles Angels traded C Carlos Perez to Atlanta Braves for 3B Ryan Schimpf. March 18, 2018 Atlanta Braves optioned 3B Ryan Schimpf to Gwinnett Stripers. March 5, 2018 Tampa Bay Rays traded 3B Ryan Schimpf to Atlanta Braves for cash. March 3, 2018 Tampa Bay Rays designated 3B Ryan Schimpf for assignment. December 12, 2017 San Diego Padres traded 3B Ryan Schimpf to Tampa Bay Rays for SS Deion Tansel. October 2, 2017 San Diego Padres recalled 3B Ryan Schimpf from El Paso Chihuahuas. June 9, 2017 San Diego Padres optioned 3B Ryan Schimpf to El Paso Chihuahuas. June 14, 2016 San Diego Padres selected the contract of Ryan Schimpf from El Paso Chihuahuas. December 2, 2015 3B Ryan Schimpf assigned to El Paso Chihuahuas. November 25, 2015 San Diego Padres signed free agent 3B Ryan Schimpf to a minor league contract and invited him to spring training. November 6, 2015 OF Ryan Schimpf elected free agency. August 29, 2015 OF Ryan Schimpf assigned to Buffalo Bisons from New Hampshire Fisher Cats. July 24, 2015 OF Ryan Schimpf assigned to New Hampshire Fisher Cats from Buffalo Bisons. July 17, 2015 Buffalo Bisons placed OF Ryan Schimpf on the 7-day disabled list. July 8, 2015 OF Ryan Schimpf assigned to Buffalo Bisons from New Hampshire Fisher Cats. June 25, 2015 OF Ryan Schimpf assigned to New Hampshire Fisher Cats from Buffalo Bisons. June 19, 2015 OF Ryan Schimpf assigned to Buffalo Bisons from New Hampshire Fisher Cats. June 2, 2015 OF Ryan Schimpf assigned to New Hampshire Fisher Cats from Buffalo Bisons. May 30, 2015 Buffalo Bisons placed 2B Ryan Schimpf on the temporarily inactive list. May 2, 2015 2B Ryan Schimpf assigned to Buffalo Bisons from New Hampshire Fisher Cats. April 6, 2015 2B Ryan Schimpf assigned to New Hampshire Fisher Cats from Buffalo Bisons. December 10, 2014 Tomateros de Culiacan placed 2B Ryan Schimpf on the reserve list. December 8, 2014 2B Ryan Schimpf loaned to Tomateros de Culiacan from Venados de Mazatlan. October 10, 2014 Venados de Mazatlan placed 2B Ryan Schimpf on the reserve list. October 9, 2014 2B Ryan Schimpf assigned to Venados de Mazatlan. June 18, 2014 2B Ryan Schimpf assigned to Buffalo Bisons from New Hampshire Fisher Cats. May 11, 2014 3B Ryan Schimpf assigned to New Hampshire Fisher Cats from Buffalo Bisons. April 26, 2014 3B Ryan Schimpf assigned to Buffalo Bisons from New Hampshire Fisher Cats. January 15, 2013 Toronto Blue Jays invited non-roster 3B Ryan Schimpf to spring training. July 30, 2012 3B Ryan Schimpf assigned to New Hampshire Fisher Cats from Dunedin Blue Jays. April 2, 2012 2B Ryan Schimpf assigned to Toronto Blue Jays. June 9, 2011 Ryan Schimpf roster status changed by Dunedin Blue Jays. April 6, 2011 Dunedin Blue Jays placed 2B Ryan Schimpf on the 7-day disabled list. August 11, 2010 2B Ryan Schimpf assigned to Dunedin Blue Jays from Lansing Lugnuts. April 2, 2010 Ryan Schimpf assigned to Lansing Lugnuts from Auburn Doubledays. March 20, 2010 2B Ryan Schimpf assigned to Toronto Blue Jays. July 30, 2009 Ryan Schimpf assigned to Auburn Doubledays from GCL Blue Jays. July 28, 2009 Ryan Schimpf assigned to GCL Blue Jays from Toronto Blue Jays. July 27, 2009 Toronto Blue Jays signed 2B Ryan Schimpf.